The very briefest of weather windows seemed to be opening up over the weekend following my unsuccessful trips described in Part 1. Heavy showers and sunny intervals were forecast for the Saturday evening followed by a sunny couple of hours first thing on Sunday morning. I decided to go for it. All was quiet when I arrived at the lek site in the early evening. The setting itself looked a bit scrappy – probably linked to some abandoned quarries nearby – but suddenly four blackcock swept in together. Almost immediately they took up their stances and hostilities began. It was quite comical really; these birds were quite clearly not strangers to each other and yet all of a sudden it was handbags. While the light wasn’t good, the distances I would be working at were very useful. I took a series of images of the birds over the next hour and a half, at which point – for no apparent reason – the grouse flew, only to return again just before dusk. I felt reasonably confident that a morning session would be profitable, so set my alarm clock for 5.30 am; I should get a decent night’s sleep………. At 2.30 am the first rally car sped past. For more than an hour there was the sound of burning rubber on tarmac every few minutes as one car followed another around the bend beside which I was parked up. One stopped alongside and the driver shouted “hello?” before heading off again. 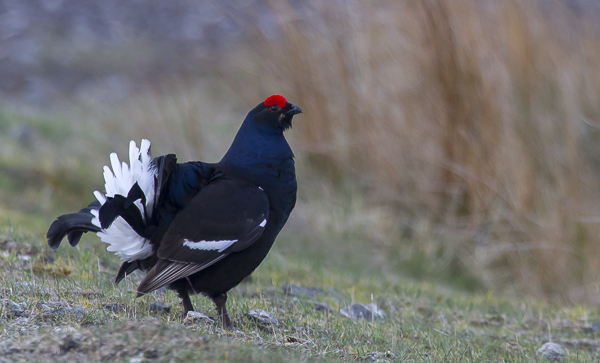 As silence eventually fell over the moorland at 4 am, and the very first hint of dawn began to appear, the bubbling and hissing sounds of lekking black grouse became apparent. I could just see their white tail feathers in the gloom through my binoculars. It looked like some serious action was underway on the lek. By 5.30 it was just about light enough to begin work with the camera and such are the joys of having a camper van, I did not need to leave the warmth of my sleeping bag to do so! Just sit up, reach over for the camera and open the side window….. While the promised sunny morning did not actually materialise the birds did come very close, closer than I could have hoped for, really. I recalled the adverts I had seen on the internet offering dawn visits to hides near leks for upwards of £100 a go. Here I was doing the same thing in much more comfort for free! Other leks not too far away could be heard in a light breeze. And fortunately several other birder/photographers who arrived later on did not leave their vehicles until after the birds left of their own accord. Light levels were quite poor, however, and it seemed likely that any photographs of moving birds would be disappointing. Nevertheless I felt that the series of portraits I took of standing birds should contain at least something usable, and this has proved to be the case. I’d like to have a go here in brighter sunlight at some stage but I feel now that I’ve made a good start on the new project. And it really was third time lucky. This entry was posted in Uncategorized and tagged bird photography, black grouse, lek, lekking, Nature Photography, weather winow. Bookmark the permalink. They’re quite a sight aren’t they, all puffed up doing their thing? Must get over there myself one of these days. Do you know when they stop lekking? We’re off to Anglesey for a week tomorrow, getting the last few things out of the old house and having some time over there. Really looking forward to getting there. Jack joins us on friday evening to take charge of his stuff. Do drop in if you happen to be in the area. I’ll have the mobile on. In case you don’t have it, 07940 850358. Or the house phone is 01248 430516. It’s a very strange thing all round. What possible survival value could it have, one wonders? Presumably the females are off in the forestry somewhere, incubating and protecting the young, and the chaps just go off and strut about. Apparently they do it year round apart from mid-summer when they are moulting, although spring is meant to be best. I’m on Skokholm this week, should have gone this morning but it was too rough. Still hoping to get over tomorrow. This weather is the pits – yet again……..